Providing thorough coverage of implementation, migration and management issues for Exchange 2000 and 2003, this book also describes the best practices of one of the largest Exchange consulting groups outside Microsoft. This revised edition features key updates based on two years of consulting practices from Exchange 2000 service packs and the new Exchange 2003 (code name Titanium) release. It also offers expanded coverage of performance and updated coverage of clustering issues. It has been cleared of out-of-date material and the coverage of basic introductory material has been streamlined. Consultants and corporate IT professionals installing and managing Exchange Server messaging systems. This includes developers, administrators, and system designers. Tony Redmond does it again! He provides detailed real-world information that will make you an expert on Exchange 2003. This book is a clear, to-the-point source of information filled with sound practical advice. Whether you're new to Exchange or upgrading your existing Exchange systems, this detailed guide can help you tap all the power, performance, and features of Exchange 2003. This is recommended reading for my staff and it should be for yours as well. 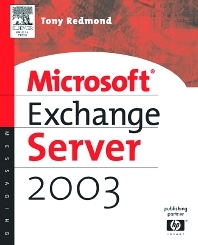 David Espinoza, Group Manager Exchange Engineering, Operations and Technology Group, Microsoft "Tony Redmond peels away the myths, mysteries and misconceptions surrounding Exchange 2003 and guides the reader safely through the many trip-wires that lie in wait. This book is mandatory reference material for any corporation embarking on a phased migration to Exchange 2003 while keeping the corporate messaging infrastructure running. Another great text from the master of the subject." Kevin Barrett, Vice President & Chief Information Officer, Elan Corporation plc. Tony Redmond is the Vice President and Chief Technology Officer of HP Services, the largest consulting company for enterprise-scale deployments of Microsoft technology in the world. He is one of the world’s leading authorities on Exchange Server. In his position at HP, Tony works alongside many skilled professionals who work with Fortune 1000 companies to plan, deploy, and manage technology integration to achieve business success and so lay the foundation for the best practice explained in his books. Tony writes regularly in Windows IT Pro magazine (www.windowsitpro.com) and has written ten other books for Digital Press.